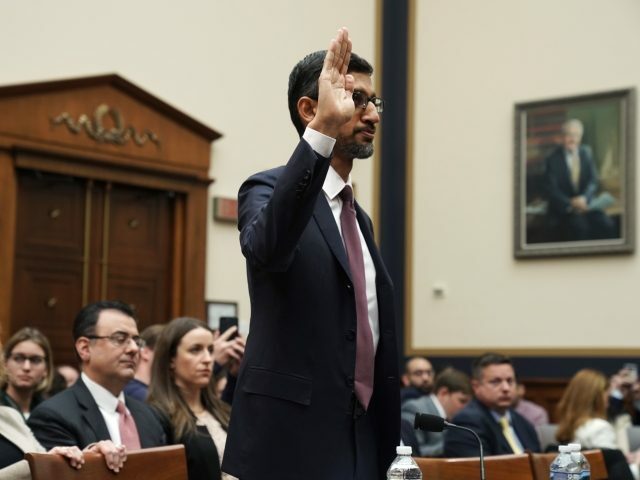 Several Republican congressmen stood out during Google CEO Sundar Pichai’s hearing before the House Judiciary Committee, Tuesday. Breitbart News has pulled from its extensive coverage of the Google hearing in order to present the five best GOP representatives to question CEO Sundar Pichai on topics ranging from political bias to the tech giant’s reliance on Wikipedia. Rep. Matt Gaetz (R-FL) questioned Pichai over Google’s political bias, citing the recent Breitbart News exclusive report which revealed a group of Google employees attempting to take down Breitbart News’ advertising. “How can I have confidence that you’re protecting the sanctity of your system when you don’t even know your employees are getting together on your own company’s infrastructure to talk about political activity?” declared Gaetz after Pichai admitted that he hadn’t looked into the anti-conservative group. You can read the full transcript between Gaetz and Pichai here. Rep. Jim Jordan’s (R-OH) questions about Google’s efforts to boost the Latino vote in “key states” prompted Pichai to deny the company having done so, despite the fact that it has been proven through leaked emails. Pichai, who was testifying under oath before the House Judiciary Committee, repeatedly told Rep. Jim Jordan (R-OH) that the detailed description of voter turnout efforts in the leaked emails was not correct. Rep. Jordan highlighted two lines from the emails, in which Google’s head of multicultural marketing, Eliana Murillo, described Google’s get-out-the-vote efforts. Pichai says “we are very concerned whenever there are allegations like that –” but Jordan interrupted and directed him to answer the question, whether “we” in both of Murillo’s sentences refers to the company Google. Extraordinarily – particularly given that he was under oath – the Google CEO denied it. The statement is significant for two reasons – firstly because the statement is clearly false. Murillo’s email, which Breitbart News published in full earlier this year, clearly refers to efforts by Google to boost Latino turnout in key states. Secondly, Pichai concedes that such activities would be a “partisan” activity. So, once it can be shown that Murillo wasn’t lying, Pichai has no way to claim that the get-out-the-vote efforts were non-partisan. Rep. Lamar Smith (R-TX) made several good points during Pichai’s hearing, highlighting a report from Dr. Robert Epstein on Google’s ability to swing votes and report from PJ Media about the dominance of liberal media outlets in search results over conservative sources. During the conversation between Smith and Pichai, the Google CEO denied any bias, dodged questions, and claimed human employees are unable to manipulate algorithms. Google has long faced criticism for manipulating search results to censor conservatives. Conservative individuals and organizations have had their pro-Trump content tagged as ‘hate speech,’ or had their content reduced in search results. An enforcement of immigration laws has been tagged as hate speech as well. 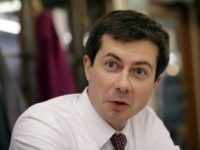 Such actions pose a grave threat to our democratic forum of government… PJ Media found that 96 percent of search results for Trump were from liberal media outlets. In fact, not a single right-leaning site appeared on the first page of search results. This doesn’t happen by accident, but is baked into the algorithms. Those who write the algorithms get the results they must want, and apparently, management allows it. Dr. Robert Epstein, a Harvard-trained psycologist authored a study recently that showed Google’s bias likely swung 2.6 million votes to Hillary Clinton in the 2016 election. Google could well elect the next president with dire implications for our democracy. This should be a real concern to all but the most politically partisan. Those at the top set the tone. It will require a Herculean effort by the Chief Executive and senior management to change the political bias now programmed into the company’s culture. Rep. Louie Gohmert (R-TX) also brought up a number of vital issues during the hearing, including Google’s preferential treatment of information from Wikipedia — an unreliable source of information. Gohmert criticized Google for placing unreliable information from Wikipedia at the top of most search results in its own special panel, and criticized Google subsidiary YouTube’s partnership with the far-left Southern Poverty Law Center (SPLC), arguing that Google should be held liable when false information by the two is made. Rep. Steve King (R-IA) questioned Pichai on the search giant’s algorithmic bias against conservatives.